It is an established fact that Dubai is a business hub for entrepreneurs around the world. Businesses from all around the world are taking advantage of the policies adopted by the government of Dubai for growth of commerce and trade activities. These businesses are set in both mainland and free zones in Dubai. Both these areas provide several opportunities for entrepreneurs. But the business opportunities don’t remain favorable for all entrepreneurs at every time. The time may come when a business would like to end its presence in Dubai. An example is the current situation in Dubai after implementation of VAT (value added tax) in UAE. Though, the tax is quite minimal at just 5% and the government is also trying to facilitate businesses to overcome the burden, but even then few corporations might find it difficult to go through with the extra fee (tax) on them and would find it appropriate to end their business in the emirate. In this situation, there is a complete process to end your business in the emirate of Dubai. The first step to be taken during this process is the deactivation of trade license. 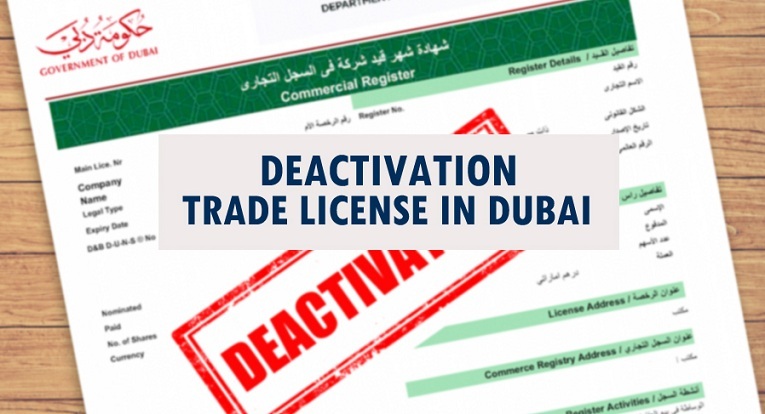 The process of cancellation or deactivation of trade license in Dubai is different for different types of companies. License deactivation for civil company or sole establishment is relatively easier as compared to the license of LLC (limited liability company). It is important to note that it takes around 40 to 60 days to cancel trade license in the DED (Dubai Economic Department). In the initial stage, the company has to get clearance from various government departments including, Ministry of Labour, Immigration department, DEWA (Dubai Electricity & Water Authority) etc. There are two stages for cancellation of license in DED. In the first stage, the cancellation application will be prepared and the cancellation contract will be made notary public and also publish in two local newspapers where claims can be made for 45 days. In the 2nd stage, the visa and company established card will be cancelled and the owner will receive clearance from DEWA, Etisalat and Dubai customs. In order to make this whole process simple and convenient, you can contact Riz & Mona Consultancy via our WhatsApp # 971-56-9971225. We are specialist in dealing with various business procedures including deactivation of trade license in Dubai and other parts of UAE.